It's been an extraordinary summer by anyone's account. Much has happened on both a local and national level, and, as individuals, we may have many different reactions to these events. As an artist, I believe that my work is to pursue my vision of beauty in an effort to nurture and deepen our connection with this beautiful earth we inhabit. I strive to maintain ties between heart and hand, between hand and earth, and between plant, paper and cloth. This August, I was honored to be chosen to create a suite of monoprint collages for a new cancer center, part of the NYU Langone Medical Center in Long Island, NY. I was moved by the challenge of creating a collection that would both inspire, challenge and even entertain patients as they received their chemotherapy treatments. As an artist and art therapist, I can't think of anything closer to my heart. When the work is framed and installed I look forward to sharing the images with you. To see of the work in progress, click here. During the long, hot days of July, I took a week long retreat in my back yard with a propane tank and a 40 gallon pot as company. Determined to explore eco printing in more detail, I was able to create a stack of papers, many of which found their way into collage. The week over, my appetite was whetted for even more. I headed to San Francisco to study with Dorothy Yuki at San Francisco Center for the Book. There I learned the beauty of combining fine art papers with humble ingredients to produce beautiful and many layered results. 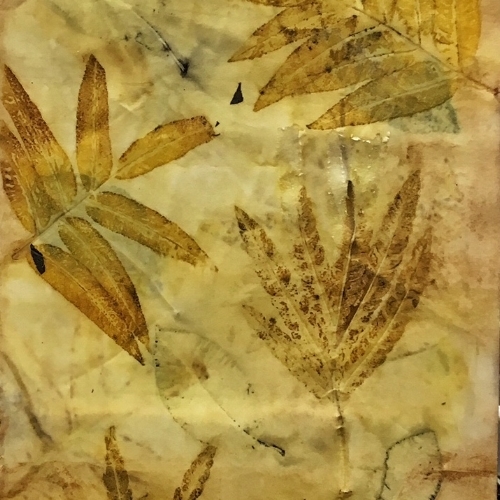 I'm very excited and am brewing a workshop of my own which I'll share soon; it will include a primer to ecoprinting, monoprinting and the art of combining these together in a collage format. Stay tuned!